Care Initiatives Hospice - Cedar Rapids volunteers Sheryl Hein (left) and Ann Howell spent hours in the past few weeks stitching together dozens of colorful holiday pillowcases. Along with Ann's husband, Steve, and Spiritual Care & Bereavement Counselor James Goodrich, the group had the pleasure of delivering the festive decorations to residents at Lantern Park Specialty Care (Coralville), Crestview Specialty Care (West Branch) and Heritage Specialty Care (Cedar Rapids). What a great way to spread the spirit of the season! 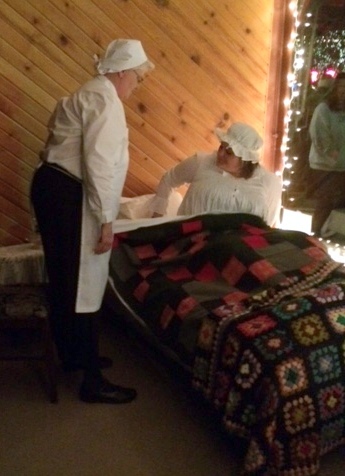 Albia held its annual Victorian Christmas December 5. Downtown windows are decorated with an old fashioned twist in the era of Scrooge. Care Initiatives Hospice also got in on the act. Montezuma Specialty Care is pleased to announce that it has received a “Deficiency Free” result on its annual survey in September by the Iowa Department of Inspections and Appeals. Ready to learn more? Contact Care Initiatives to discuss your loved one’s health care needs.